"Homelessness can be caused by a variety of problems. The main cause is unaffordable housing for the poor. Secondary causes include mental illness, physical illnesses, substance abuse,..."
Unaffordable housing is in part the result of gentrification of neighborhoods. It is much harder to find cold water flats or housing by the week than previously. Mental health issues come into play with the use of medication instead of institutionalization. Patients who in the past would have been in-patient are released with medication prescriptions. The history of mental illness and homelessness. Who is homeless? This site lists statistics on homelessness. Directory of local homeless services - point someone in the right direction. Information from the American Library Association about the homeless. Information on Library outreach to homeless people from the American Libraries Association. An opportunity to gain empathy for the homeless. Participate in this maze to gain empathy for the homeless. Bibliography on Library Services to Poor People – 1970 to the present. Bureau of Primary Health Care. 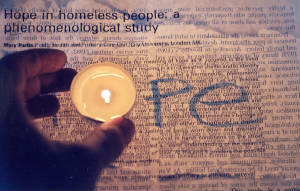 This site provides bibliographies organized by subject related to homelessness. Need journal articles? Search this database for journal citations on 8,800 published items on homelessness, health care and mental illness. Try google scholar to find citations and full text articles. Never deprive someone of hope... it may be all they have.